Clay-ish: rich in nutrients, but very fine particles, so it clumps together so much that there’s no air spaces between particles. Doesn’t drain very well. Sandy-ish: almost no nutrients, but very large particles, so drains very well. So well in fact it’s hard to keep plants hydrated. Loamy-ish: this is your preferred quality, a combination of both clay and sand, so enough fine particles to hold onto water, and enough course particles to let it go. Notice the happy little worm in the middle of the pic enjoying the combination of loam and organic matter. I’ve posted two short videos here to demonstrate nice loamy soil that sticks together weakly, and slightly too sandy soil that I bought as garden soil amendment. Organic matter bulks up soil making it “fluffy”. It is also what attracts earthworms and microorganisms, both of which do the real work of making soil healthy. 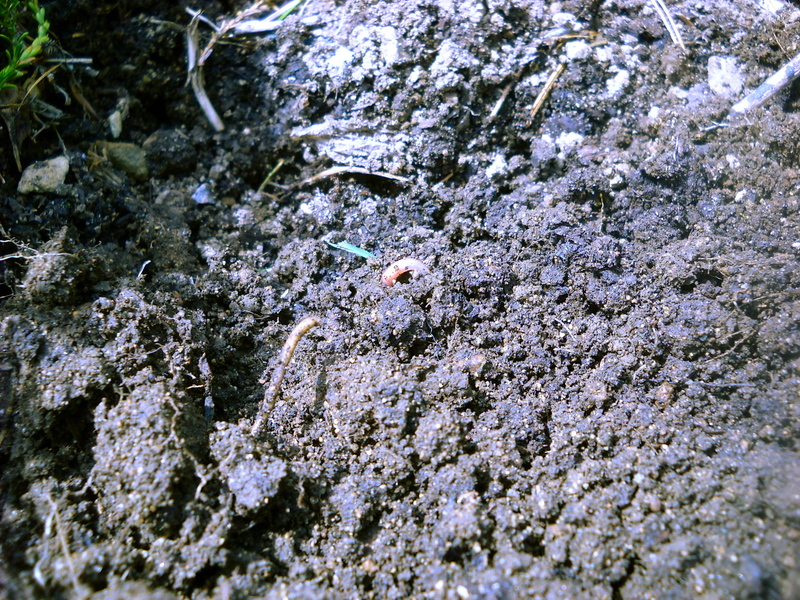 Earthworms eat small portions of food and plant material, leaving behind “castings”–earthworm poo, aka “black gold” (not to be confused with “black gold–Texas Tea”). And bacteria and fungi are able to take molecules of nitrogen that are unavailable to plants and convert it to ammonium and nitrate that is available to plants. Optimal soil is loamy and rich in organic matter. But really, we have what we have, and trying to change it can be an exercise in major frustration! Wendy tells me she has clay soil. Her backyard is flat, at the bottom of a hill, and in the winter the turf is VERY soggy. In the summer it’s so dry it’s like straw; she figures that because there isn’t enough depth of topsoil on top of the clay so it’s difficult for the grass to put down deep roots. Really sounds like she’s got it right. Unless you’ve got at least 6″ of topsoil, preferably 8″ of topsoil, grass will not do well. There just isn’t enough depth for a reservoir of moisture and nutrients deeper than the roots, so they don’t reach downward. And if underneath that not-quite-deep-enough layer of topsoil is predominately clay, the clay creates a barrier underneath the layer of topsoil allowing a pool of water to collect when it’s wet. Roots of plants that aren’t really “bog-tolerant” will either rot, or just stay shallow. When the rains stop the pool of water eventually dries out, but the grass roots are still petty shallow and suffer from the relative drought. Even if you water the lawn regularly, there’s still that clay barrier just a few inches away preventing proper drainage. Wendy thought she would like to dig it all out, put a better layer of topsoil, and seed a new lawn. What do you think? What would you advise Wendy to do? For those who are interested, here’s an excellent short article on managing turf on clay soils. There seems to be no one solution to improving the site. If you scrape and replace, you’ve still got the layer of clay underneath, and sooner or later end up with the same results. 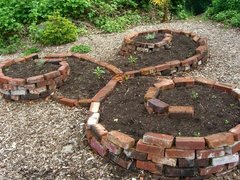 If you regularly add layers of organic matter on top, eventually the worms will do a great job of incorporating the OM with the clay without the damage that rototilling would do. Do you want to work on this project for 5 years or so? (I would.) If you already have large shrubs or trees, they have adapted to the current level of the ground, and their superficial roots would surely not appreciate several inches of material on their heads, effectively suffocating them. So if you do choose the “top dressing” option, keep those layers less than about 2-3″. 1. Substitute your grass turf with another lawn alternative. 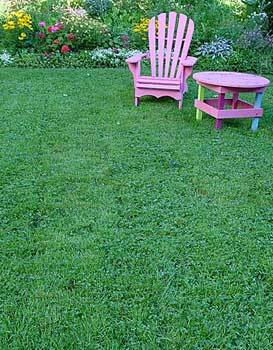 Thanks to A Small Green Space for her picture of a clover lawn. Dutch White Clover will grow from seed on your clay patch, and if you already have grass “growing” there, the clover will happily coexist. If the site is bare, sow a lot of clover. Sedges are another option, such as Carex “Hime Kawasuga” or C. pennsylvanica, short growing, underground spreading, infrequently mow-able clumping grasses. 2. Raised beds. Instead of trying to manage the whole yard, build several raised beds with pathways in between. These can be your typical 2×8″ boards filled with compost and soil, or something a lot more attractive and creative-looking like dry-stack stones in less rectangular shapes. Dry-stack bricks, not dry-stack rocks, but still very cool. This has been an overly long post, so I’ll stop here and save the rest for a future post. Do you have soil that is less than Ideal? 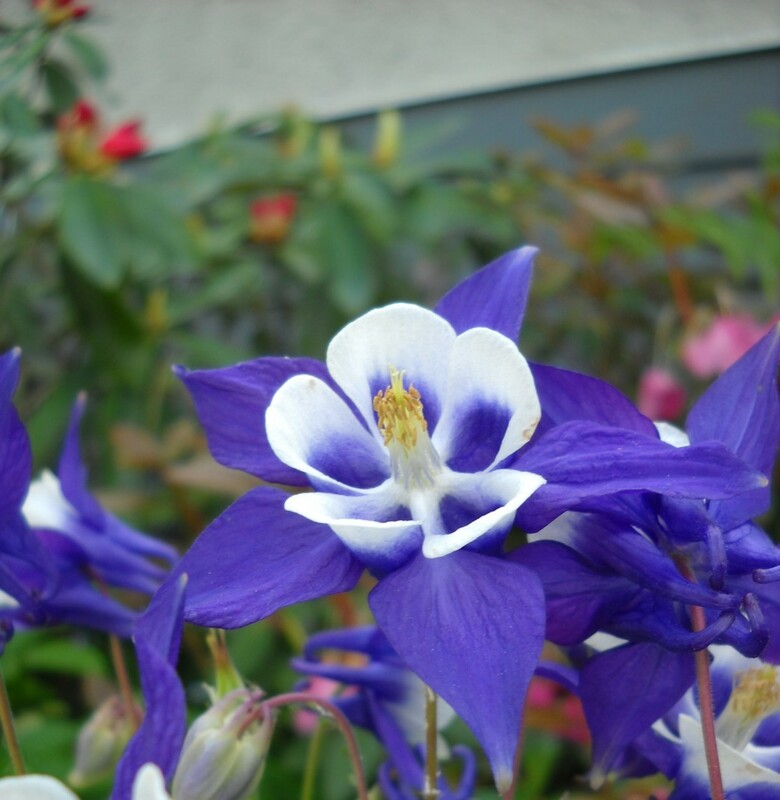 In fact, how do I even know if it is less than ideal, or if it’s my less-than-optimal technique that’s responsible for under-performing plants? Leave a comment, share this to your favourite social network site, ask questions. You don’t need to suffer with a garden space that doesn’t meet your needs. Let’s get things working better!